I am looking for two logo's to be created that mirror and comliment my existing logo (Fun 2 Dive see attached). These new logos will be Fun 2 Kayak and Fun 2 Scallop. I want the 2 on these logos to have something related embedded into them similar to how the 2 in my exisiting Fun 2 Dive logo has a manatee face in it. I want the same fonts and colors to be used as in Fun 2 Dive logo that I have attached. The Fun 2 Kayak logo should have something kayak or paddle elated designed into the 2 and the Fun 2 Scallop logo should have a Scallop shell designed into the 2. It seesm there is some confusion about what I am requesting. The new logos should NOT have the same image in the 2 as the new logos. 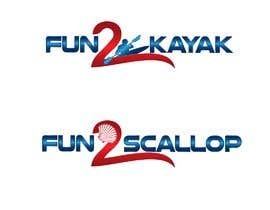 The new logos should have a kayak or paddle related image in the Fun 2 Kayak 2 and the new Fun 2 Scallop logo should have a scallop image in the 2 of the logo. If you are not altering the image in the number 2 from the priginal logo that I provided then I will have to reject your entry. Please submit both logos on the same entry so that I can easily provide feedback at one time. I would also like to have the 2 from each logo seperated and included in its own file set to be used alone at times in advertising work. The new logos should NOT have the same image in the 2 as the new logos. The new logos should have a kayak or paddle related image in the Fun 2 Kayak 2 and the new Fun 2 Scallop logo should have a scallop image in the 2 of the logo. If you are not altering the image in the number 2 from the priginal logo that I provided then I will have to reject your entry. And you accept those entries which are not as according to your brief. I didn't get that. Are you with your description or not ??? I am requiring the 2 to be altered and the manatee face removed from the Kayak and Scallop logo. I have seen some great logos where the kayak and scallop image have to been incorporated into the 2 but on those I am asking the designer to remove the manatee face from the submission. YOu have only provided one logo submission when my description asks for both a Kayak and a Scallop logo to be submitted. I will review your submission when both are received. Thank you. Please Check #139 #140 > Zoom In + Transparent Background Preview, Thanks.